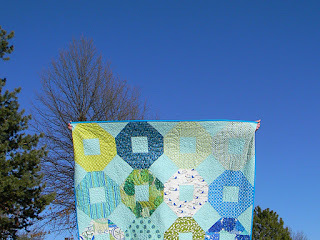 I finally got my quilt back from Stitch, and I'm excited to show you a few more shots of it. Thanks to my husband for holding up the quilt on a very chilly, windy day. 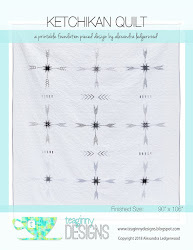 You can download the quilt pattern now as a pdf. Click the photo below for an affiliate link to the pattern. 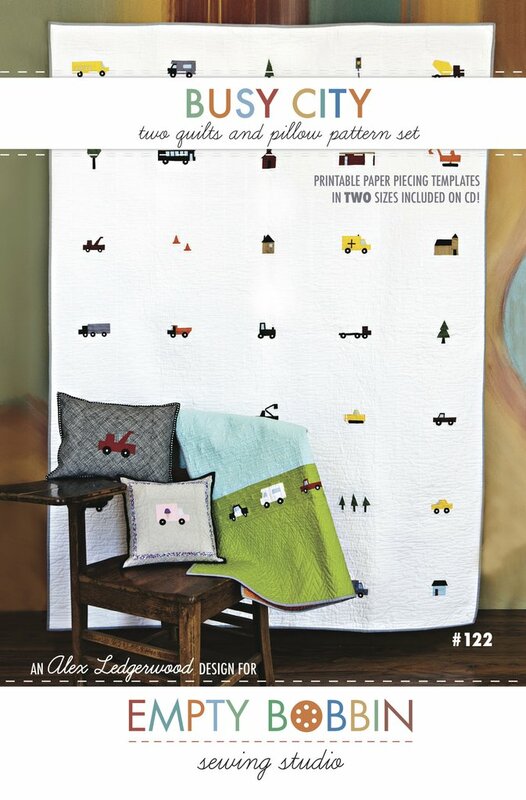 My quilt was in the Feather Your Nest section of the magazine. I chose Valorie Wells' Nest fabrics, along with some coordinates. See Aunt June's feather fabric there on the right in lime? Perfect! 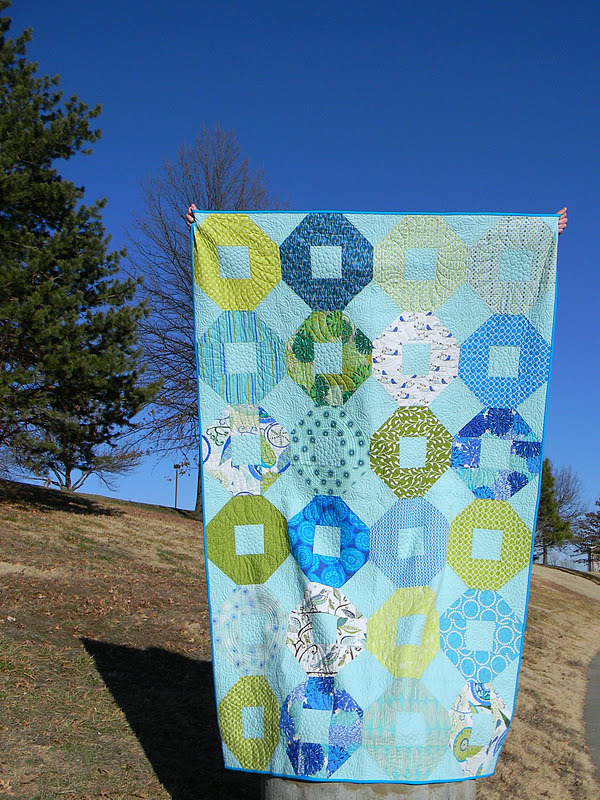 I used a big panel of the feature fabric on the back of the quilt. Angela Walters brought out the theme brilliantly in the quilting. Can you see she quilted a few of the shoo fly blocks as nests, complete with eggs in the center? 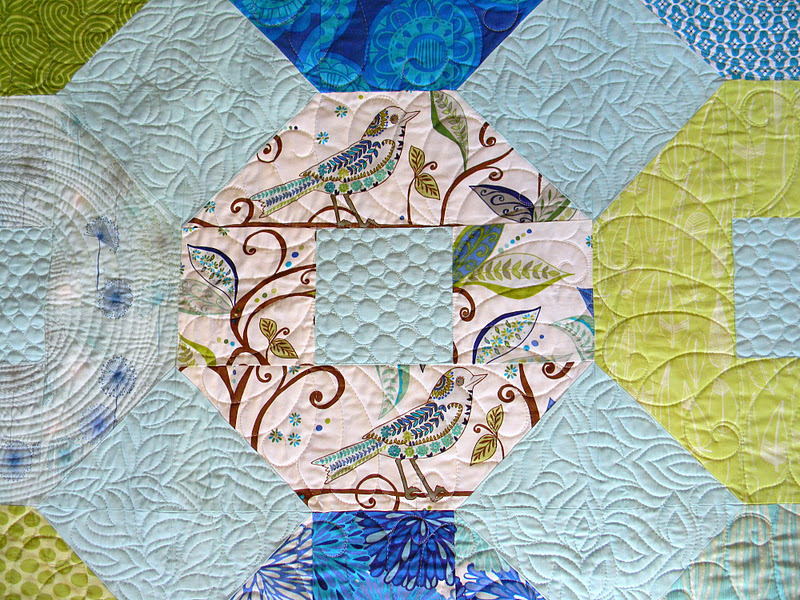 The other blocks are done with beautiful feathered shapes and pebble quilting. You can see it more clearly on the back. 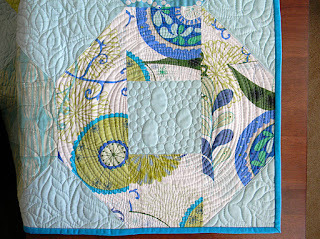 Angela's quilting took this quilt to a completely different level. Thank you, Angela! 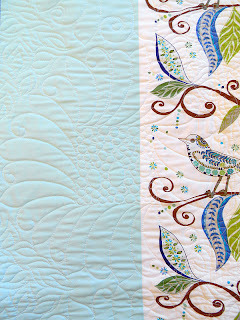 You can read more about this quilt and the block I designed for it here, here, and here. That is a wonderful quilt. Love it! And I like how you did the sew & flip corners for the two halves of the "O" shapes, it really helps to show off those fabrics. So gorgeous! 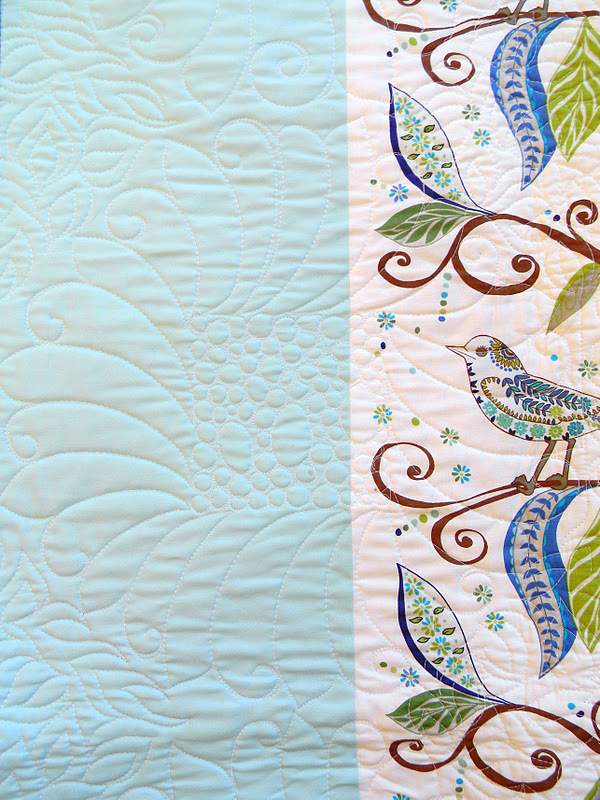 That quilting is jaw dropping. Congrats on the feature! when i saw that quilting i wondered if angela had something to do with it! 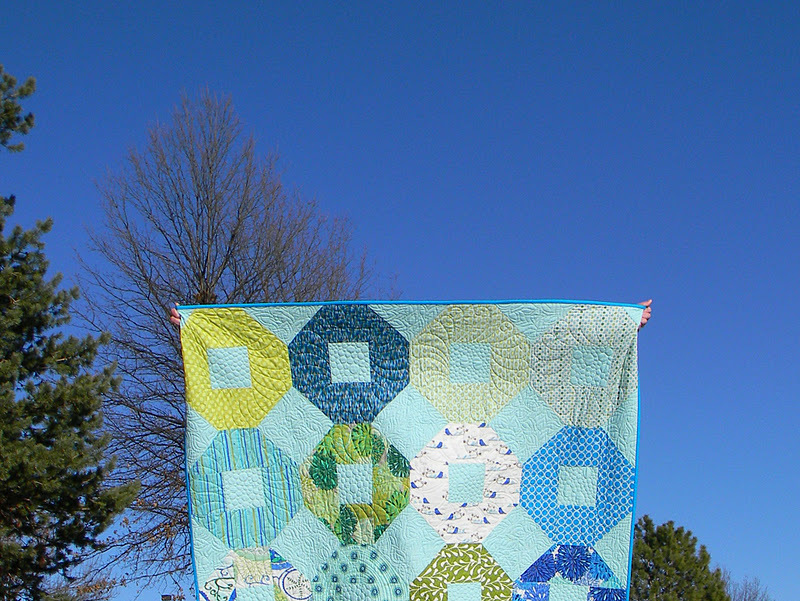 it is such a pretty quilt! lovely! Gorgeous! Your colour choices are lovely. Angela did an amazing job on the quilting - wow! The nests are awesome! What a great idea! So awesome! I had forgotten that I was included in this masterpiece, I feel honored! So pretty! 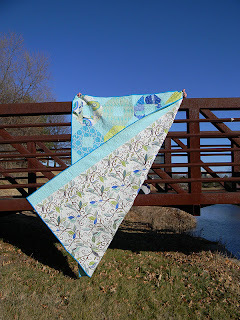 I love the colors and the quilting is amazing as always! 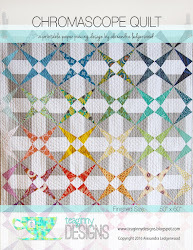 This quilt is stunning! I loved it in the magazine and really appreciate the extra details you write about and show here.